A citizen of France, he is also both an Honorary and Naturalized Citizen of the United States. He was born 7 years after Bach’s death. When America needed a helping hand, Lafayette provided it. 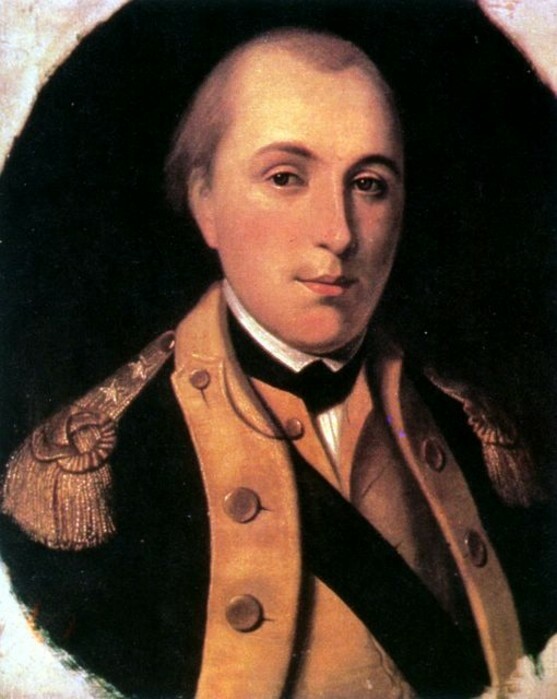 Perhaps the greatest foreign volunteer in U.S. history, he was serving with bravery and distinction as a General under George Washington when the meager manpower, arms and money of a ragtag revolutionary force were being overwhelmed by British forces. Lafayette returned to France and obtained the crucial increases in French aid that brought independence. Together with his wife Marie Adrienne Francoise de Noailles, he dedicated his life to the highest principles of both the French and American revolutions. His personal commitment to equality for all exceeded that of the founding fathers. The United States became a great country when the post-Civil War America embraced his vision, and the energy of the immigrant and the disenfranchised helped provide the fire in the belly that fuelled the industrial revolution, and together with education, is the beating heart of America today. Serving with distinction at Valley Forge during the terrible winter of 1777-1778. when General Washington sent him on a reconnaissance mission to Barren Hill (now Lafayette Hill). His generosity to his American troops--many of them Pennsylvanians-- was legendary. He spent $200,000 of his own money to pay for their much-needed items such as clothing and weapons at a time when the American economy was on the verge of collapse. He encouraged the French government to accede to Ben Franklin's brilliant diplomatic skills that led to the signing of the French Alliance on February 6,1778. Realizing Washington's dangerous military dilemma by late 1778 and still awaiting the military and financial help promised the Americans by his country, he returned to France and argued for a speedy delivery. He arrived in Paris and Versailles January 1779. Using his diplomatic skills, he made strong appeals to three influential ministers: Vergennes, Maurepas, and Montbarey and King Louis XVI himself to send Washington a French Expeditionary Force complete with all supplies as soon as possible. The king sent him back to General Washington at Morristown, New Jersey on March 1780 with a secret message: the Expeditionary Force was on its way. Thousands of crack French troops, marines, and battleships with massive aid arrived at Newport, Rhode Island July 1780. All historians agree that without this help, Washington would have lost the War for Independence. Washington and Franklin credit Lafayette with the effort behind the delivery of these desperately needed supplies. Using American style democracy as his moral and political compass, he thus became a leader in another rebellion: the French Revolution of 1789. Knowing that if taxation without representation was tyranny to Americans, it was no less tyrannical to Frenchmen and women. He therefore defied the greed of his fellow noblemen whose riches accumulated over the centuries because they were seldom required to pay any taxes. Lafayette's Declaration would relieve this heavy burden on the backs of the common people by requiring everyone, including all noblemen and royalty, to pay their fair share. To honor this legendary figure and his visit, Congress, at the Capitol Building, placed a portrait of Lafayette on the right side of the rostrum of the House Chamber with Washington's portrait on the left side of the rostrum.The American flag is displayed between the portraits behind the Speaker's Chair. No other foreign dignitary has ever been so honored in any of the two Congressional chambers. He named his son George Washington Lafayette to honor his spiritual father and military hero and named his daughter Virginie after Washington's home state. An American flag has flown at his graveside since World War I when General John Pershing visited Lafayette's tomb with a large military entourage to show continued respect for America's greatest foreign volunteer. As a result of his American influences such as Washington, Franklin, and Jefferson, Lafayette had spent the rest of his life in a political crusade fighting for the rights of man and the rule of law. He generously gave active financial and moral support to the Poles, Greeks, Irish, English, Scots, Italians, Portuguese, black slaves, women, South Americans and anyone else who needed refuge at his place at LaGrange near Paris, and he gave many speeches at the National Assembly on their behalf. He was especially vehement in denouncing the persecution of Protestants and Jews in France. Guided by Lafayette's record in racial equality and civil rights, Lafayette College set the standards for the integration in Pennsylvania Colleges by permitting Aaron Huff, an African American who was Lafayette's first black student, to enroll in 1832.